I have completed the residency program at Cité internationale des arts in Paris through July–September 2015. Thank you very much for all your supports on my research. How Did Architects Respond Immediately after 3/11 (The Great East Japan Earthquake)? Traveling exhibition How Did Architects Respond Immediately after 3/11 (The Great East Japan Earthquake)? has started from Sendai (2 March 2012 – 18 March 2012) and at The Japan Cultural Institute in Paris (6 March 2012 – 31 March 2012). I had been working for this exhibition as an editor to make the exhibition panels, organize the contents including films, models, furniture and cardboard shelters that were actually used in the evacuation shelters. We are pleased to report that the exhibition ARCHITECTURE AS A PIECE OF NATURE finished in Milan on April 29th with a very positive response. Over 350 visitors attended the opening reception, with hundreds more passing through the gallery during Design week. 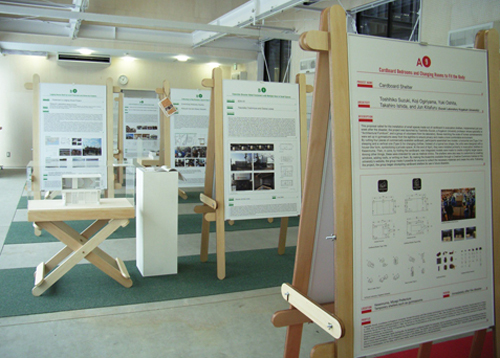 We’ve posted a short film on our website showing the exhibition. We are thankful for the tremendous support and feedback, and we look forward to welcoming you at the the next venue. This exhibition focuses on three leading figures of the new ‘young generation’: Sou Fujimoto, Junya Ishigami and Akihisa Hirata. Directed by Maris Mezulis, the exhibition projects a view of the architects’ ideas and inspirations through a stream of images, offering a comprehensive yet experiential understanding of the architects’ unique vision. Premiering at Spazio FMG Gallery during Milan Design Week 2011, the exhibition will travel worldwide throughout 2012. JDS/Julien De Smedt architects lectures and book launches in Tokyo and Kyoto, exhibition in Kyoto. I am working on this project as a coordinator/PR in Japan. Agendibition is an exhibition of architecture through the expansion of a book, turning a narrative into a space. Presented as a spatial experience, the book is laid out so that the entire contents can be seen all at once on the gallery walls. The pages are supplemented by physical models and images on display in the center of the gallery space. Agenda started as an architecture book, occupying the territory between a monograph, a diary, and a collection of essays, interviews, and conversations. It documents the work and thinking of JDS Architects over a specific year marked by crisis, beginning on September 15th, 2008, the day that Lehman Brothers filed for bankruptcy. Bringing together diverse forms of content, Agenda is a product of vigilant observation, introspection, and engagement with outside thinkers and collaborators — artists, curators, politicians, authors, economists, journalists, developers, educators, and architects. The final result, on display at Sfera, is the book as it has never been seen before. In 2008, I wrote an article about JDS on the magazine called Architecture Note. Here is their book, Agenda which was published by actar at the end of 2009.